The procedure to place an implant varies from patient to patient. Dr. Culberson will bring experience, precision, attention and state-of-the-art technology to the details of your case. Prior to surgery, treatment options are discussed with you at your consultation appointment. At the time of the surgical implant placement, a local anesthetic will be administered to numb the area where the implant will be placed. Some patients prefer the adjunctive use of sedation therapy. When you are comfortable, Dr. Culberson makes a small incision in the gum tissue to reveal the underlying bone. He then gently and carefully creates a pilot hole in the supporting bone using special instruments, then gently inserts the titanium implant. 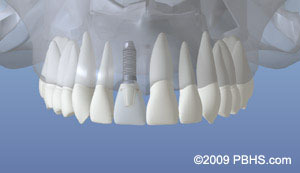 The top of the implant is open for the insertion of the abutment. This opening is covered immediately after insertion of the implant with a covering screw or healing cap. Now the healing begins. The length of time varies from individual patients, implant location, the quality and quantity of bone, etc.. 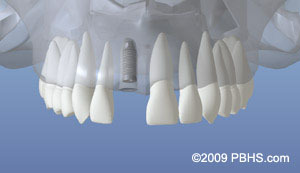 In some cases, implants may be restored immediately after they are placed. Dr. Culberson will advise you on follow-up care and timing. After the initial phase of healing, if not placed at the time of implant placement, Dr. Culberson will place an abutment (crown connection) or a healing cap onto the implant during a brief follow-up visit. This allows gum tissue to mature and provides access to the implant. In some cases, Dr. Culberson may deem it beneficial to perform a soft tissue graft to obtain stronger, more easily cleaned and natural appearing gum tissue in the area around the implant. This process involves moving a small amount of gum tissue from one part of your mouth to the area around the implant. If your tooth has been missing for some time, the adjacent support bone is likely to grow thinner and shrink. This occurs because the root of the natural tooth has to be present to stimulate the bone. As much as one half of the supporting jaw bone volume can be lost in the socket area during the first year following tooth extraction. If you are missing enough bone, you may benefit from having additional bone regenerated into the area. This ensures the implant will be adequately supported when it is placed in the jaw.